I have a love-hate relationship with under-the-saddle bags. I love having the needed tools in order to fix the 90% of common breakdowns that can occur during a road ride - primarily punctured tubes and bolts that manage to wiggle their way loose at inappropriate times. However, I hate how most of these bags look. Boring Cordura nylon shaped into shapes that are far from attractive and do a poor job of holding their shape. 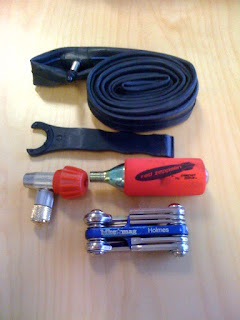 Many roadies will just stuff their needed tools into their jersey pocket, but that's not a good option when wearing a backpack while commuting to work. And I don't keep the tools in the backpack as I need them for when I go on weekend rides. For the past eight years a frumpy Axiom bag has resided under the saddles of many different road bikes that have come and gone from my bicycle fleet. 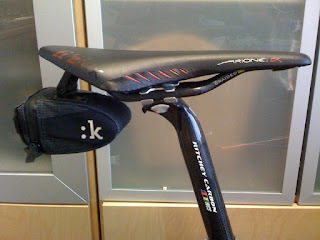 While it was durable and competently held the contents, it's unabashedly ugly and the strap that wraps around the seatpost has lightly chafed the clearcoat on my carbon post over the years. 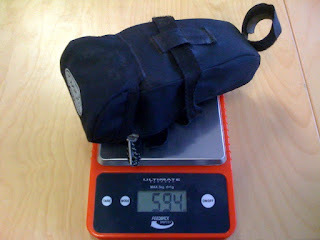 There are now many nice, low-profile bags on the market. But as an owner of several fantastic fi'zi:k saddles, I finally took advantage of the ability to switch over to one of their small saddle bags that cleanly mounts using their Integrated Clip System into a port on the underside of the saddle. True, it's still a primarily-black nylon bag. But smaller and imbued with a nice dose of Italian style and good design, some reflective logos and not requiring a seatpost-chafing strap. I've also re-evaluated my tool selection. 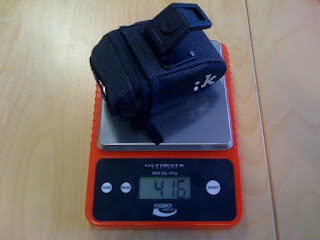 I had been carrying a much-heavier and bulkier Crankbrothers mini tool along with a compact pump. But after experiencing exactly one puncture over the last 14 months of road riding out here, I decided to go with a CO2 system and not worry about carrying the pump for back-up.